Cheap fast food doesn't have to be so bad for you. Controlling portions, making healthy swaps and taking other small steps can go a long way. Maybe you know to plan and prep healthy meals for the upcoming week to save time and money. And maybe you usually have a slow cooker of heart-healthy stew simmering by the time you get home or a freezer full of homemade meals ready to thaw. It’s getting harder to claim ignorance when devouring a bacon cheeseburger and, in it, a silo’s worth of sodium and saturated fat. The truth is out there — and easy to find. Make healthy choices by using the nutrition info listed on most fast-food restaurants’ websites. Or ask for nutrition facts at the restaurant. The Food and Drug Administration requires large restaurant chains to provide written nutrition information for standard menu items upon request. Specifically, they must share items’ total fat, calories from fat, saturated fat, trans fat, cholesterol, sodium, total carbohydrates, dietary fiber, sugars and protein. Tracking your spending by hand is tedious. Throw away your paper budget and sign up for NerdWallet to make managing your money easy. If it’s the crunch and munch that you really want, don’t deprive, but be reasonable about portions. At fast-food joints, “It’s easier to control portions than it often is at sit-down restaurants,” she says, because there are so many size options. Order a “snack” size of those curly fries instead of a large, and you’ll cut about 920 milligrams of sodium. 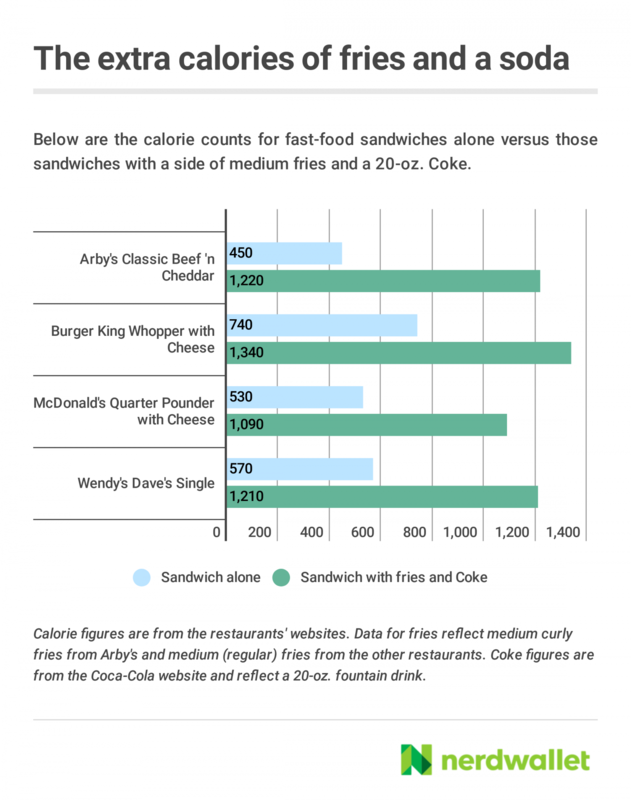 Skip Burger King’s Triple Whopper with Cheese, which packs a whopping 32 grams of saturated fat, and go for the Whopper (12 grams) or Whopper Jr. (5 grams) instead. While you’re choosing burgers, keep in mind that toppings like bacon and cheese can add up. For example, that regular Whopper already has 12 grams of saturated fat and 980 milligrams of sodium. Upgrade to the Bacon and Cheese Whopper, and you’re looking at 17 grams of saturated fat and 1,560 milligrams of sodium — 68% of the recommended daily value of sodium. Other ways to keep portions in check include ordering from the kids menu and choosing just the entree, rather than a combo meal. Smaller portions mean a smaller bill, because you’re buying less food. Same goes for reducing portion sizes by sharing. If you’re traveling with family, “Not everyone needs a meal deal with fries,” Warshaw says. Split a large order of fries, or have one person order the combo and share. Everyone else can order just the entree. While the nutritional components vary among fast food items, “They’re, generally speaking, going to be high in refined carbohydrates, light in whole grains, light in vegetables, light in fruit and heavy in fat,” Warshaw says. So, with that in mind, she suggests asking yourself how you can make your meal healthier. One answer: Make substitutions. Ask for the side salad instead of the fries, for example, or for whole-grain bread instead of white. You usually have many opportunities to request healthier substitutions and tweaks at restaurants where you can see employees making your meal, she adds. Ask for another handful of veggies in your sub, light dressing on your salad or just a little bit of sour cream in your burrito. “Use your eyeballs to advantage,” she says. Reconsider that tuna salad if it looks heavy with mayonnaise. Substitutions and tweaks can only go so far. “The one food group that’s missing in action in these types of restaurants is fruit,” Warshaw says. Some fast-food restaurants have no fruit at all. At others, you can search the side items or kids menu to find apple slices or applesauce and maybe even a fruit cup or parfait — but that’s about it. Warshaw suggests bringing your own fruit from home if you plan on a drive-thru meal. Whatever fruit you’d bought at the grocery store will likely be less expensive than fast-food options. And maybe you’ll find that orange slices pair nicely with curly fries.